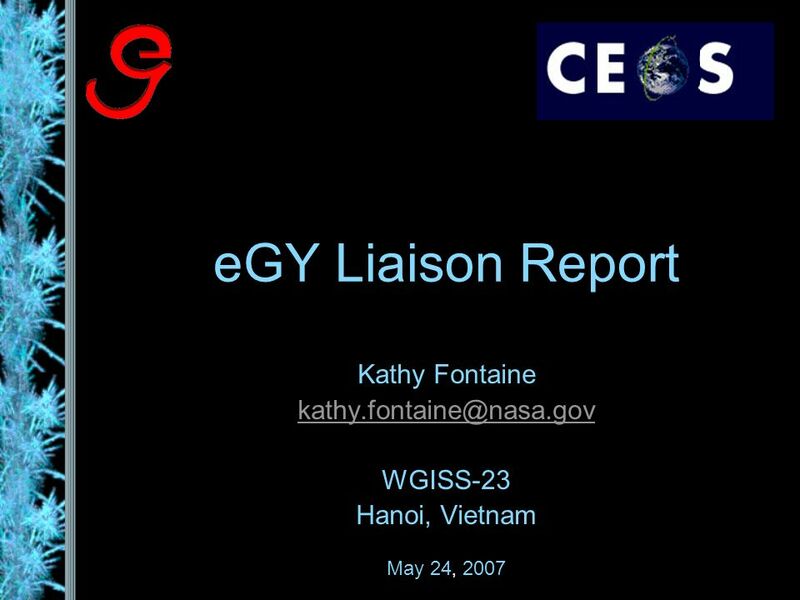 EGY Liaison Report Kathy Fontaine WGISS-23 Hanoi, Vietnam May 24, 2007. 7 Participants, contd. 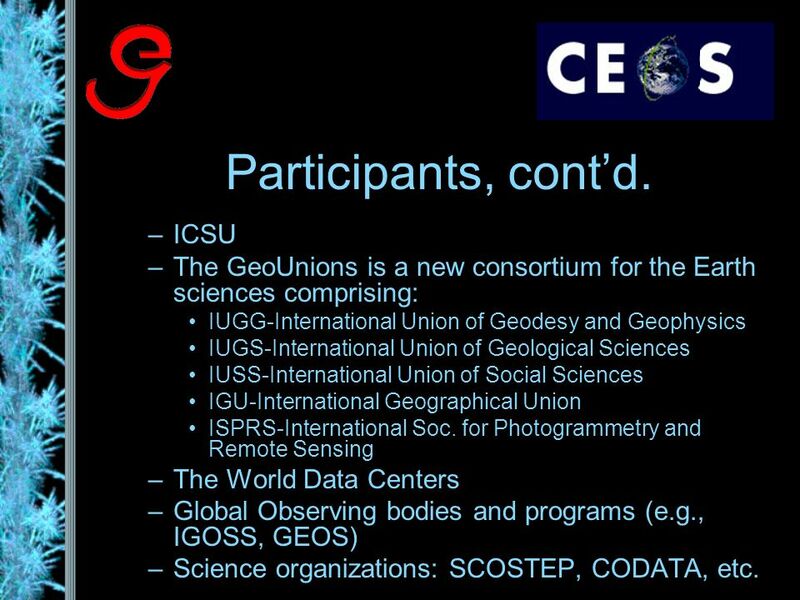 –ICSU –The GeoUnions is a new consortium for the Earth sciences comprising: IUGG-International Union of Geodesy and Geophysics IUGS-International Union of Geological Sciences IUSS-International Union of Social Sciences IGU-International Geographical Union ISPRS-International Soc. 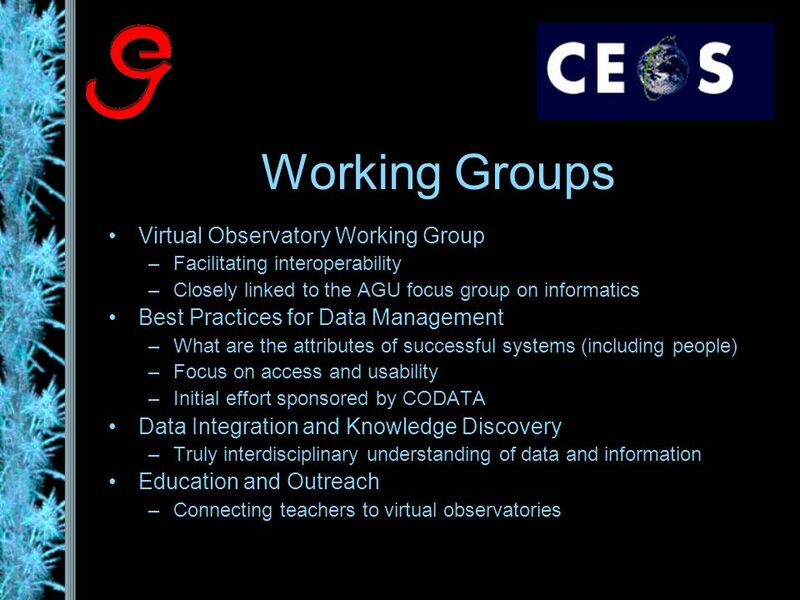 for Photogrammetry and Remote Sensing –The World Data Centers –Global Observing bodies and programs (e.g., IGOSS, GEOS) –Science organizations: SCOSTEP, CODATA, etc. 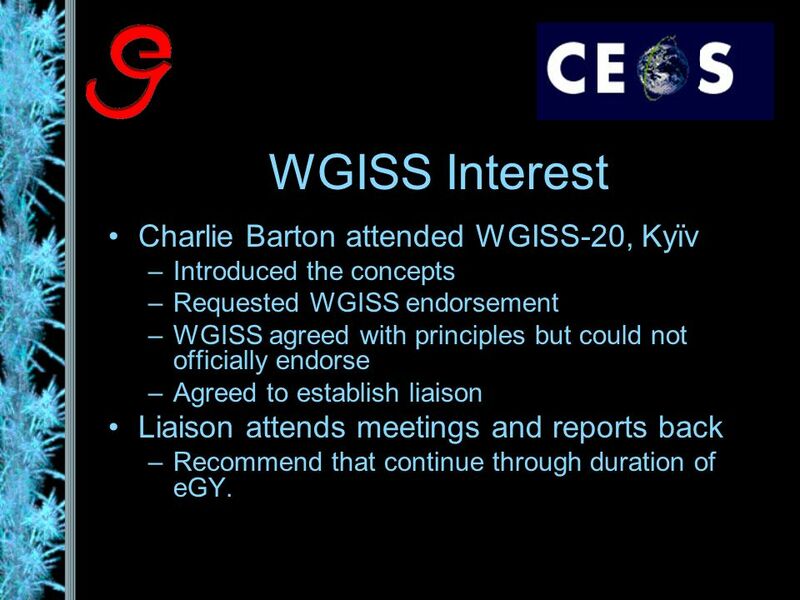 8 WGISS Interest Charlie Barton attended WGISS-20, Kyïv –Introduced the concepts –Requested WGISS endorsement –WGISS agreed with principles but could not officially endorse –Agreed to establish liaison Liaison attends meetings and reports back –Recommend that continue through duration of eGY. 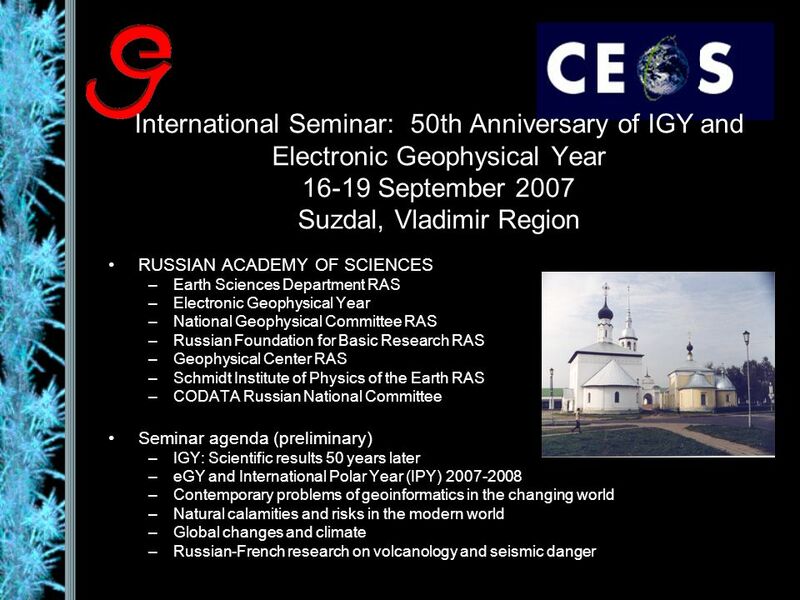 9 Activities Meeting March 13-14 2007, Boulder, CO –Discuss relationships with other organizations –Discuss meetings and other forums to present eGY concepts First European eGY Workshop hosted at GFZ-Potsdam Kick-off of eGY at IUGG in Perugia, Italy July 7 –In conjunction with IGY+50 celebration Russia-sponsored eGY meeting Meeting Feb 26-27, 2008 in Boulder to assess effort and plan closing event for December 2008. 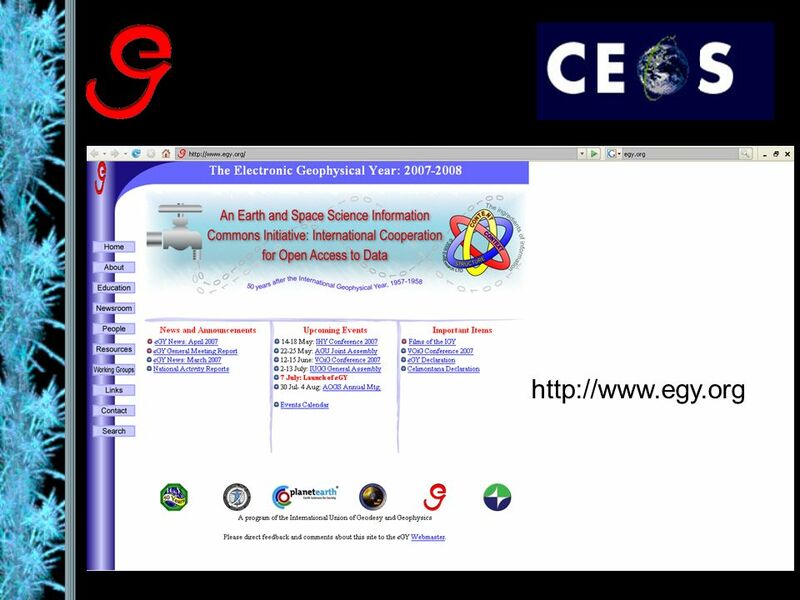 Download ppt "EGY Liaison Report Kathy Fontaine WGISS-23 Hanoi, Vietnam May 24, 2007." Mr Neil Williams Head of the Physical and Engineering Sciences Unit Madrid: 31 May 2010. 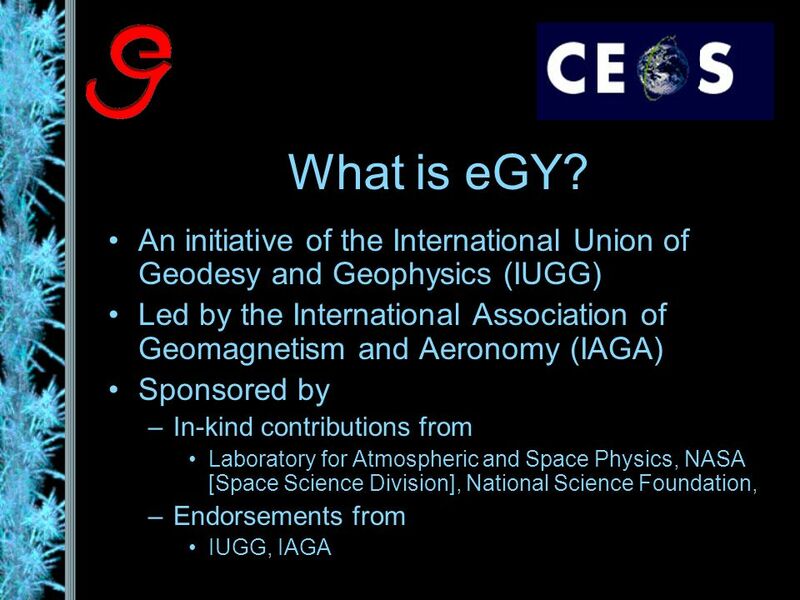 World Class Standards OGF20 OGF-ETSI MoU BoF and ETSI GRID STF 2007 call for expert Introduction to 11th May OGF-ETSI Grid testing workshop and ETSI TC. Developing the ICSU World Data System (WDS) Mustapha Mokrane ICSU Secretariat Science and Information Technology Officer. CEOS Working Group on Information Systems and Services, WGISS-24, Oberpfaffenhofen, Oct , 2007 GFZ Representative Report Bernd Ritschel, GFZ ISDC. WGISS 1 Technology and Services Subgroup Liu Dingsheng and Natalia Kussul CEOS WGISS-24 Oberpfaffenhofen, Germany October 15~19, 2007. 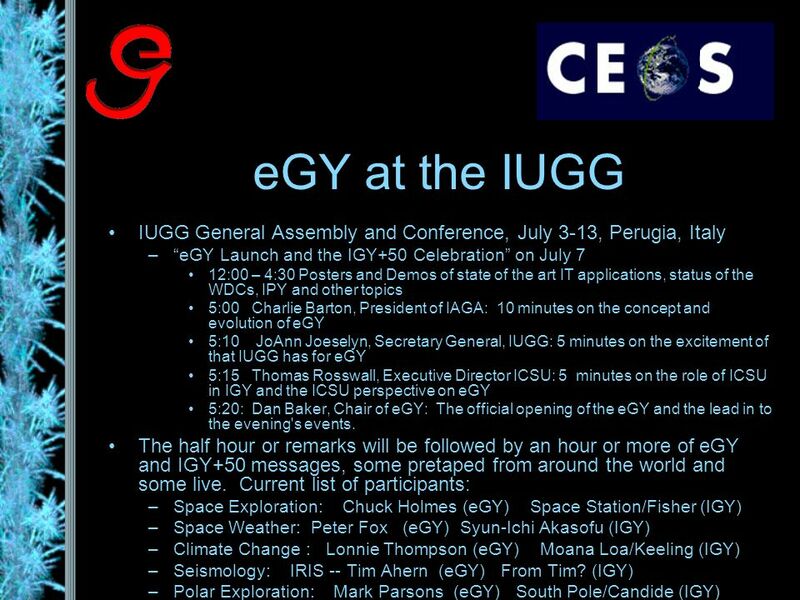 The Electronic Geophysical Year CEOS Working Group on Information Systems and Services, WGISS-24, Oberpfaffenhofen, Oct , 2007 eGY activities related. Committee on Data for Science and Technology of the International Council for Science David Clark Secretary, ICSU WDC Panel CEOS/WGISS. A&D meeting, Paris 2-3 March 2006 Users and the GEOSS Architecture Prof. René Garello, Chair ICEO A&DWG Dr. Jay Pearlman, Chair, IEEE CEO. 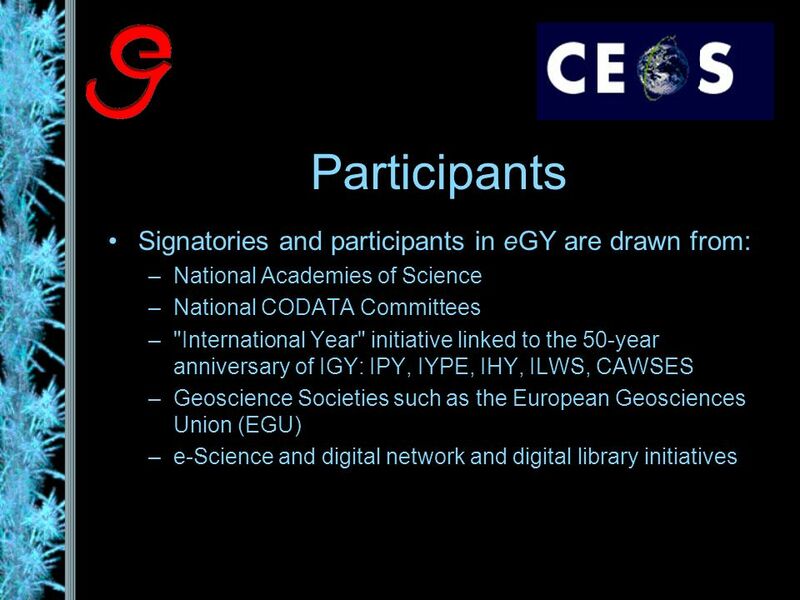 The NATURE–SDIplus project Best Practice Network for SDI in Nature Conservation Co-funded by the Community Programme eContentplus ECP-2007-GEO Co-funded. 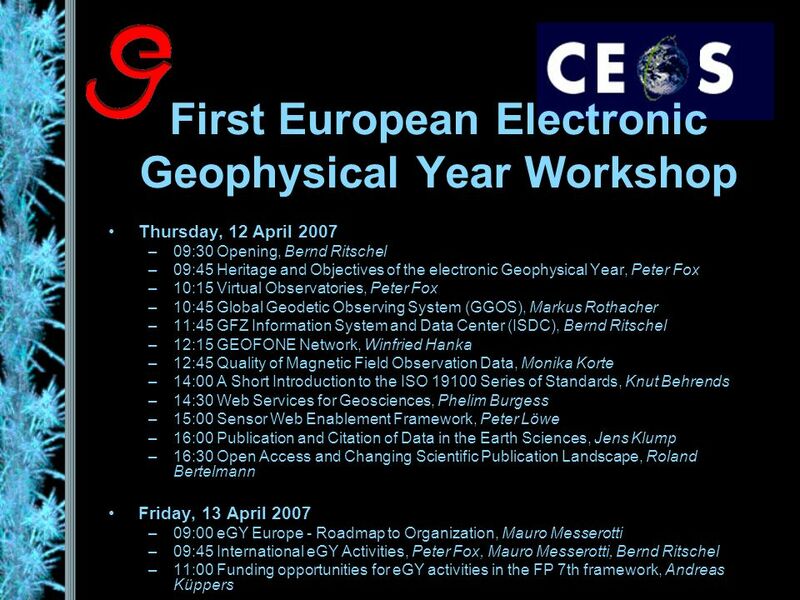 1 OneGeology Technical meeting Utrecht May 2007 Ian Jackson 30 May 2007. 1 The OneGeology project IC GS Ian Jackson, February 2007. 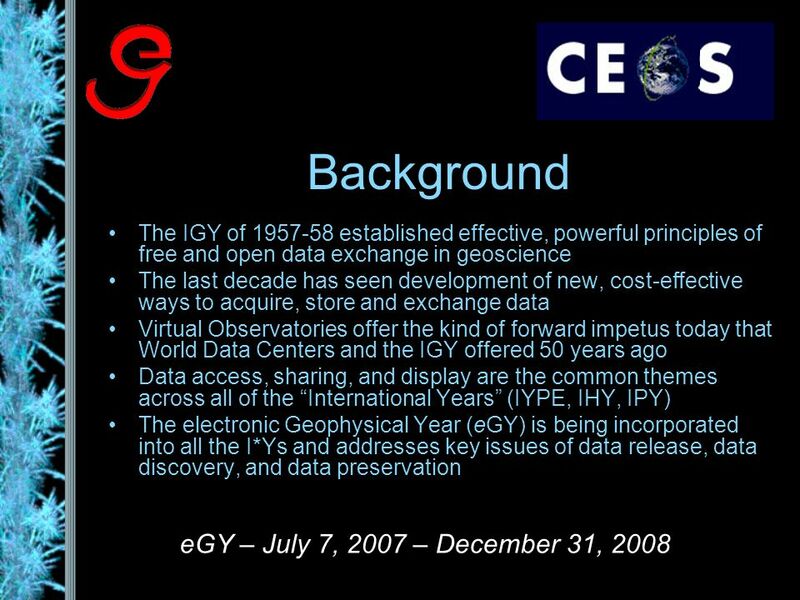 IHY ( IGY Gold History Initiative An important part of the 2007 activities will be preserving the history and memory of IGY 1957. 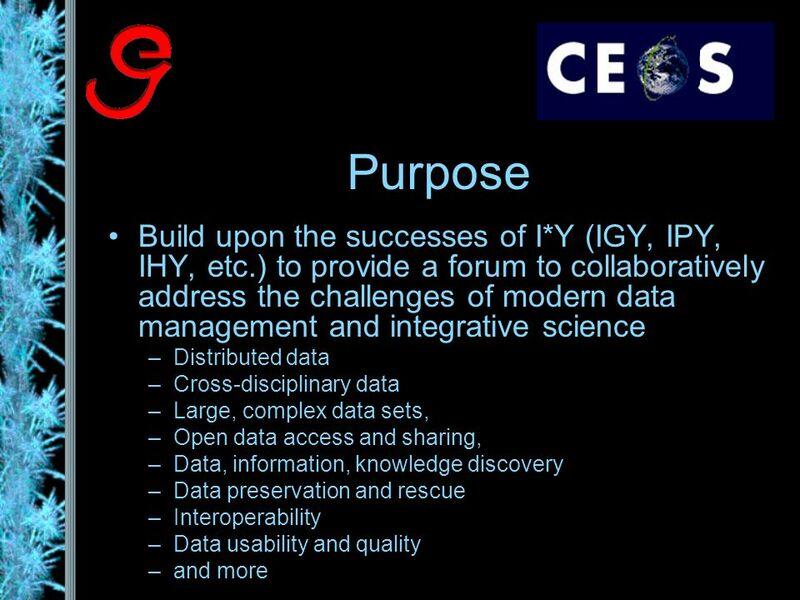 1 A Case Study in E- Science: Building Ecological Informatics Solutions for Multi-Decadal Research ARL/CNI 2008 Conference Washington, DC 16 October 2008. EVENTS LEADING UP TO AND OUTPUTS OF WCC – 3 Filipe Lúcio.